Less than two years ago, the 10 year Treasury note yielded less than 1.5%. Now we have seen the 10 year yield reach 3%. The rate change has resulted in principal loss in bond funds for many investors because bond prices fall as rates rise, and it has raised questions as to the appropriate strategy for this type of market environment. Should investors hold cash while rates are rising, and attempt to buy bonds after rates have risen? In theory, this may sound like a viable strategy but the reality is that timing the bond markets is one of the most difficult trades to pull off on a consistent basis. Since the Federal Reserve began its low interest rate policy and quantitative easing measures in the wake of the financial crisis of 2008, there have been a number of instances where rising interest rates were anticipated. In 2011, a ratings downgrade of U.S. Treasuries by Standard & Poor’s was expected to be this catalyst (it wasn’t). In 2016, the surprise election of Trump was expected to cause higher inflation because of tariffs, thereby causing higher interest rates (rates initially jumped, but then declined for most of 2017). Despite repeated calls for rising rates, 10 year treasury yields remained relatively well contained under 3% – quite low by historical standards. That’s not to say that at some point the bond market wouldn’t experience a correction, it’s just that it is incredibly difficult to predict when exactly rates will rise, and by how much. Timing fixed income investments based on interest rate predictions is little more than a guessing game. As such, you don’t want to avoid bonds because the “consensus” is that they are headed for hard times. Even in uncertain times, it’s worth holding bonds. Should rising rates occur, it may hurt bond prices in the short-run, but higher rates will actually boost bond returns over the long term (see our recent article “The Impact of Rising Rates”). A bond fund is always investing the interest payments from the bonds it holds as well as reinvesting the proceeds of maturing bonds in new bonds. When interest rates are rising, that money is being invested in bonds with higher yields, which eventually boosts the return in the long run. Another reason to hold an allocation to bonds regardless of the expected environment is that many bonds tend to perform well when stocks experience sudden declines. In 2008, for example, when the Standard & Poor’s 500 index dropped 37%, the Bloomberg Barclays U.S. Aggregate Bond Index gained 5.2%. This means that a portfolio consisting of both stocks and bonds will have a better risk-adjusted return than a portfolio of stocks alone. Another reason to avoid trying to time the bond markets is shown below – even in relatively low rate environments, moving to the sidelines can be very costly. 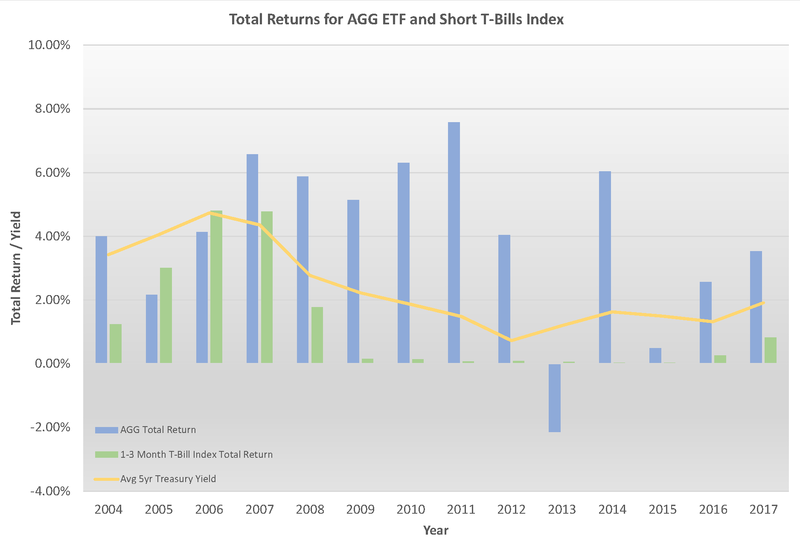 As shown in Figure 1, a diversified bond index has outperformed short term Treasury Bills in 11 of the past 14 years, (Treasury Bills are short term obligations issued by the Treasury and are considered risk free – they are often used as a proxy for “cash” rates, and we will use the term “cash” going forward). Even in the periods where Treasury yields were generally rising (from 2004 through 2006, and again from 2013 through 2017), a diversified bond index performed well relative to cash. In 2013, the bond market was hurt by concerns that the Fed would taper its “quantitative easing” program. This caused bonds to suffer their worst year since 1994, and their first loss since 1999. Still, it should be noted that this was only the third time in 34 years that investment grade bonds finished in the red. Also, even though higher quality bonds did poorly in 2013, some aspects of the bond market did well, such as high yield, senior loans and short term bonds. So, if an investor is properly diversified, they may have been able to walk away with minimal declines in value despite the spike in long term Treasury yields. However, even just looking at the period from 2013-2017, when we experienced rates rising off of their lows and the rare experience of negative bond returns in 2013, holding a diversified bond portfolio would have had an annualized return of 2.05%, compared to 0.24% for cash during that period. Holding bonds in this period still resulted in an additional $95,000 per million dollar investment. Even though the last five years had several periods in which bonds struggled – including a historically bad year in 2013, it was better to stay the course in the intermediate to long run. *Tbills represent cash for this purpose. So while bonds may not be exciting, and yields continue to be low, there are still plenty of reasons to hold them. First, it is extraordinarily difficult to predict the timing of higher interest rates, and investing in cash rather than bonds has been shown to be costly much of the time. Second, bonds tend to perform well during volatile times that can include stock market selloffs, which is precisely when good performance is needed. Finally, bonds help generate income and reduce overall volatility. In the medium to long run, most investors will be better off sticking to bonds as opposed to cash or market-timing strategies.